Michigan voters can now see where their lawmakers have stood on state business subsidies from 2001 and into the current legislative session. A new scorecard from the Mackinac Center and MichiganVotes.org shows where every lawmaker came down on votes for corporate handouts that pit regular taxpayers against select business interests and developers. Michigan lawmakers have authorized the state to spend a lot of money to subsidize businesses since 2001: $16 billion, in fact. That is more that the value of the Lions, Tigers, Pistons and Red Wings with plenty leftover. Or in state budget terms, it could pay off state employee pension debt or resurface nearly all of the state’s highways. These amounts have been pledged in the name of creating or retaining jobs in the state. But by taking tax dollars from everyone and delivering them to a favored few, the lawmakers have cost the state jobs rather than added them. It’s not a Democratic failure or a Republican failure: Business subsidies are a bipartisan affair. Over 17 years, the average Republican approved $1.47 billion in business subsidies during his or her tenure, and the average Democrat approved $1.62 billion. The overwhelming majority of legislators, both Republicans and Democrats, have voted for business subsidy programs, but Republican voters have been more likely to elect a small minority who oppose subsidies. There were 17.0 percent of Republicans who opposed more than half of the business subsidies they voted on while in office. 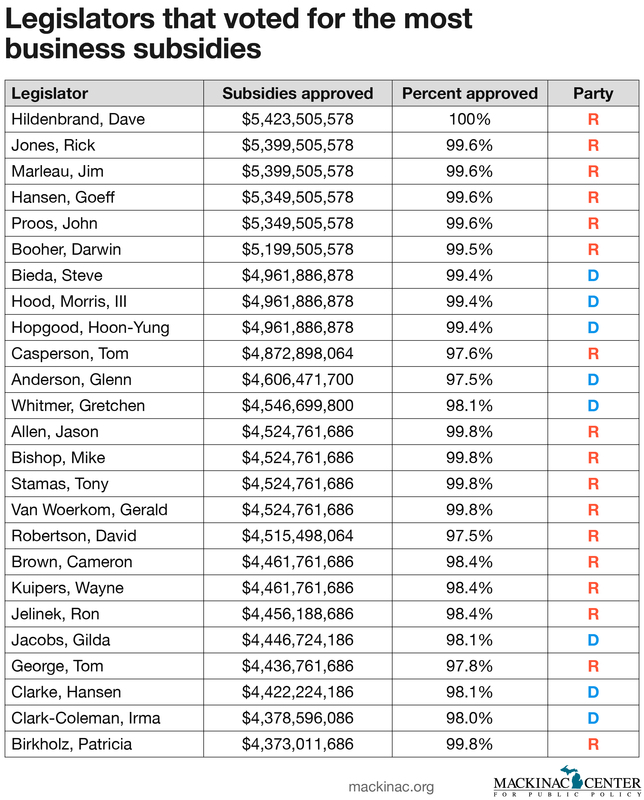 Only 6 of 233 Democratic legislators, 2.6 percent, opposed more than half of the business subsidies. 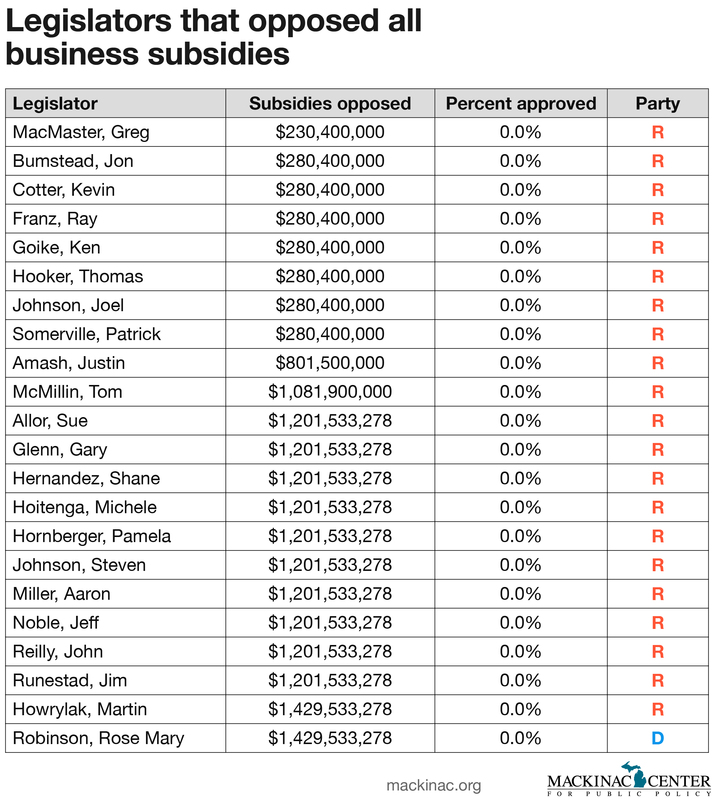 In 17 years, 22 lawmakers opposed every business subsidy the Legislature approved while they served. Only one was a Democrat (Rep. Rose Mary Robinson of Detroit). The scorecard covers two years at the end of the final Engler administration, the entirety of the Granholm administration, and all but the final year of the Snyder administration. Gov. Jennifer Granholm agreed with the Legislature to approve $12.6 billion in business subsidies. Gov. Rick Snyder has agreed to $2.5 billion in subsidies so far. The amounts covered include the authorized cash transfers to corporations, plus related administrative expenses. In most cases, the numbers came from fiscal agency or department estimates that were developed during the time when each measure was being considered. When these were not available, we used estimates that state program administrators developed. Not all of the dollars that were authorized were delivered to corporations and developers, though legislators voting to approve them did not know that when the vote occurred. And every dollar that has been delivered was done so because legislative majorities approved one of these authorizations. The scorecard includes only laws that take money from some taxpayers and give it to others. That includes state grant programs and other forms of direct support approved in annual budgets as well as refundable business tax credits. State revenue estimators expect to pay out $758 million more in credits to companies than the companies owe in taxes this year. The scorecard excludes other kinds of business favors like selective property tax abatements and nonrefundable business tax credits. The scorecard covers 37 laws passed since 2001. It includes only votes where approving new subsidies is the primary intent of the law. Subsidies thrown into massive budget bills, for instance, are excluded.